Do you think it’s funny or offensive? Do you think it’s true? Follow your bliss and doors will open. We change the world word by word. 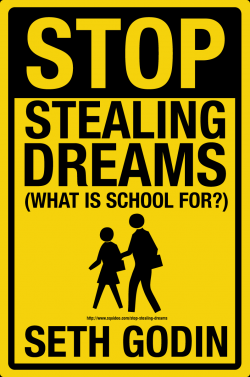 Ever since it came out in March, I’ve been meaning to blog about Seth Godin’s manifesto on education, Stop Stealing Dreams. But I’ve been too busy teaching. And learning how to be a better teacher to write about why it is so important to read that I gave a copy of the following highlights to my spring classes, and I’m assigning it to my summer classes! Here’s a hint: learning is not done to you. Learning is something you choose to do. Is There Life Beyond The Lecture? Some faculty are wonderful, engaging lecturers. Some are not. Regardless, the classroom lecture continues to be the dominant form of instruction in the college classroom today–even though all the pedagogical research I have read shows that this is NOT the best way to teach–if you want students to remember what they are learning after the class is over. Garver remembers his supervisor affirming the young lecturer’s confidence — before blowing it apart. “He basically said, ‘Mike, that was a great lecture. Have you ever heard of Bloom’s Taxonomy of Learning?’ ” Garver had not. His supervisor explained Benjamin Bloom’s 1956 formulation, which divides learning into higher and lower orders and emphasizes the importance of putting learned ideas to work. “Even though your lecture was spectacular,” Garver recalls his mentor saying, “you’re down here at the bottom of Bloom’s Taxonomy.” He challenged Garver to infuse higher orders of learning into his teaching methodology. “I have been chasing that dream ever since,” Garver says. I too have been chasing that dream. I knew from my own educational experience that most lectures made me sleepy and that even taking good notes didn’t mean I didn’t retain the material. I learned best and most deeply by “doing” something with the material: talking about it in groups, presenting it to the class, writing about it, applying it in a service learning context, using it for problem solving. Until recently, it was relatively easy for my students and I to hold seminars in class to discuss material by moving our desks into a large circle or smaller groups. Unfortunately, new buildings at the college where I teach cram as many students as possible into the classrooms using tables that go from one end of the room almost all the way to the other making it very difficult for us to do anything other than sit in rows at the long tables. And I am finding, when students are in those rows, it is easy just to stay on the stage. What teaching strategies work for you to retain information from classes beyond the final exam? What classes do you remember the most? What information from a class have you used and how did you attain that information? Insight, I believe, refers to the depth of understanding that comes by setting experiences, yours and mine, familiar and exotic, new and old, side by side, learning by letting them speak to one another. –Mary Catherine Bateson. Two weeks ago, I was asked to take over as a long term sub for an instructor who had a medical emergency. I was able to meet with the instructor, get copies of her syllabus, texts, and scores for the students etc. It was up to me to figure out how to combine her teaching style with mine in a way that would equal a smooth transition and success for her students. The first class I taught the students how to do Natalie Goldberg style writing practice and we held a council so I could learn from the students what was working for them and what they needed from the class. I then incorporated what I learned from them into a few changes in the syllabus, specifically in the essay assignments and the deadlines. This semester, my college students and I discussed the Triple Bottom Line, a bottom line for businesses that goes beyond PROFIT to include people and the planet. During the first third of the semester, we focused on the “people” part of the equation. Next, we looked at “food” as a way of seeing what we’re doing to the planet. Finally, for profit, we did some problem-posing and most of the students drew on their service learning experiences for their research papers to name, reflect and act on a problem. Service learning goes beyond community service or volunteering. Students who engage in service learning maintain a reflective journal about what they do and what they’ve learned and to do research related to their service learning site. As the semester comes to a close, I thought I’d post this TED Talk from Jamie Oliver–someone who has certainly made a name for himself when it comes to solving the problems related to diet related diseases in the US. Diet related disease is the biggest killer in the United States today, says Jamie Oliver, and we need a revolution. People are dying needlessly from obsesity and food related diseases. Obesity costs 10% of health care bills and in less than 10 years this cost will double. How to eat to save your life? Home is not where food culture is created any more. So where will kids learn about food? asks Jamie Oliver. School? Where kids have flavored milk 2x a week? Chocolate milk has the same amount of sugar in it as a soda. What can we do? he asks. 2) Fast food has to be part of the solution. We needed to be weaned off all the fat and sugar. 3) Kids at school need fresh food cooked on site, and that children know how to cook. 4) Corporations need to feed their employees responsibly. Revolutionary if you ask me. Even more revolutionary if people get on board! Some good advice here, New Spice Guy–thanks! 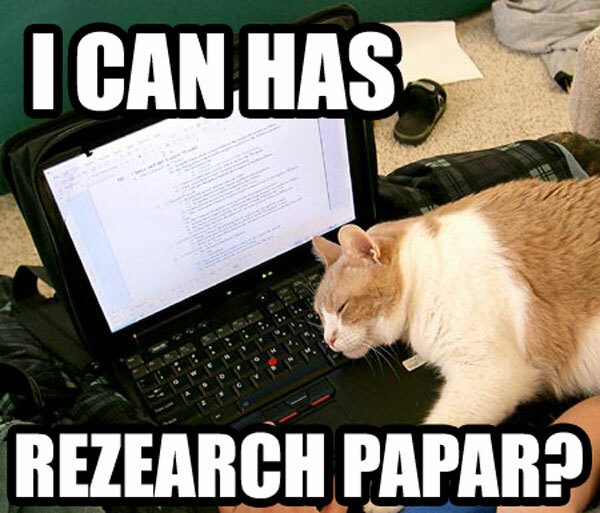 I CAN HAS REZEARCH PAPAR? Blogger danah boyd was just named as the smartest academic in tech. She’s a researcher at Microsoft Research New England and a Fellow at the Harvard Berkman Center for Internet and Society who received her PhD from the School of Information at UC-Berkeley and now lives in Boston, MA with her cat (which is NOT pictured at left). Buzzwords in her world include: public/private, identity, context, youth culture, social network sites, social media. She blogs to express random thoughts about whatever she’s thinking. So I’m now following her on twitter and intend to keep tabs on her blog as well. What else is there to say except this is a great introduction to library research AND to grad school shenanigans. University students: want to win a trip to Africa? NICHOLAS KRISTOF wants to take YOU to Africa! Nick Kristof wrote in his Sunday column about his 2010 Win-a-Trip contest where he’ll take a university student with him on a reporting trip to Africa, giving that student a chance to blog for nytimes.com and to file videos to The Times and Youtube. According to Kristof, the contest is open to students at American universities – either undergraduates or graduate students – who are 18 years old or over. Consult the full rules for more about eligibility. To apply write an essay of up to 700 words, or a video of up to three minutes, or both. Send the essay to winatrip@nytimes.com. Post the video Youtube www.youtube.com/NicholasKristof, next to the video invitation for applications. Explain why you should be picked to go. — journalism student Casey Parks who had never been outside the U.S. and had grown up poor, in the deep South. The application deadline is a minute before midnight, Eastern Time, on Monday, Jan 18; the winner will be chosen by February and travel commences in April, May or June and will last about 10 days. Just in case you don’t win, Kristof suggests exploring the following opportunities: Self-Employed Women’s Association of India and BRAC in Bangladesh, both accept some volunteers. Those interest in health, might go to the Edna Adan Maternity Hospital in Somaliland, Africa. Teach English to brothel children in Calcutta at an anti-trafficking organization called New Light, run by Urmi Basu or contact World Teach that can connect you to possibilities to teach English abroad, from Namibia to Micronesia.